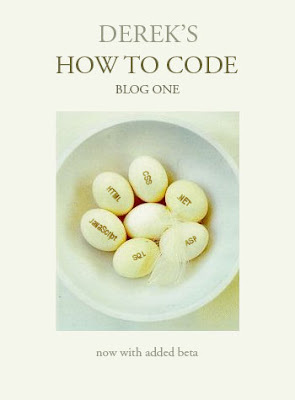 Derek says:: Merge with "How to Code"
Initially I thought it was a good idea to write separate blogs because people interested in gadgets and codecs aren't necessarily interested in code and databases. I've since realised three things; that the target audiences were pretty much the same, that dividing my traffic was a bad idea and that I don't really have enough to say or the time to fill two blogs. So, having just finished copying all the posts over from Derek's How to Code, I'll be deleting it and maintaining just the one from now on.